Hello friends, this morning Chris and I are on our way to Mexico to start our wedding celebration. The wedding is not until Monday, May 30th, so we will have a few days of sun and relaxation before we tie the knot. While I am enjoying my vacation south of the border, I have some guests posts in the next few days from personal friends of mine, who are also foodies. Enjoy today’s recipe, book review and a giveaway! I was contacted a few weeks ago by Vega to see if I’d like a copy of the new book Must Have Been Something I Ate, by Peggy Kotsopoulous, along with some samples of Vega’s products. I immediately replied, Yes of course! I was interested in checking it out because I have been a fan of Vega products and have attended Brendan Brazier free seminar at my local health food store. I like that the book is easy to follow and have a casual and funny tone, yet very informative. The author is not preachy in her approach to teach you how each food can affect your mood, weight, beauty and your health in general. I also like the fact that 90% of the food she mentioned in the book are already food I eat regularly and are pantry staples in our house. What I learned from the book is how each food can help with imbalances that we may feel with our body. Are you stressed and anxious? Do you feel tired and not sleeping well? Do you suffer from stomach issues? I received the book a few weeks ago and I immediately read the chapter that focused on anxiety and stress. I could definitely use some help in reducing some stress and anxiety while planning the wedding. I found sweet potato to be included in the list of “food that help you chill” and Peggy writes in the book all the reasons why. 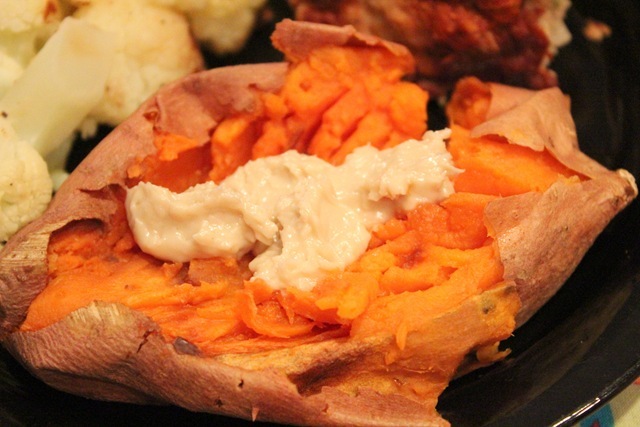 I love having coconut butter with my roasted sweet potato and I was happy to learn that fats increase the absorption of beta-carotene. Peggy suggest eating sweet potatoes with a little drizzle of extra virgin olive oil, hemp seed oil and my favorite, coconut butter. Yummy! The last chapter in the book is for recipes. 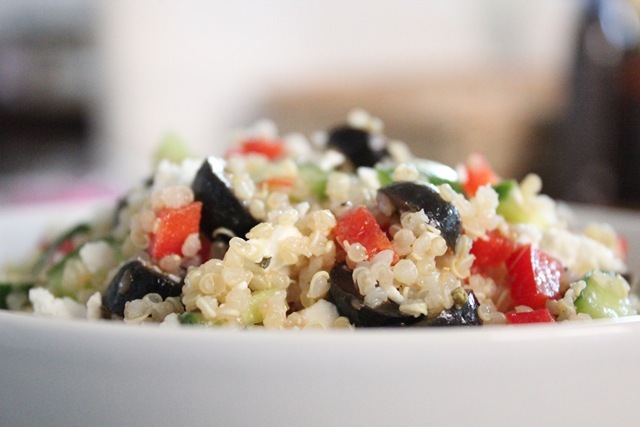 Since I already had all the ingredients on hand, I was excited to try the quinoa salad recipe from the book. 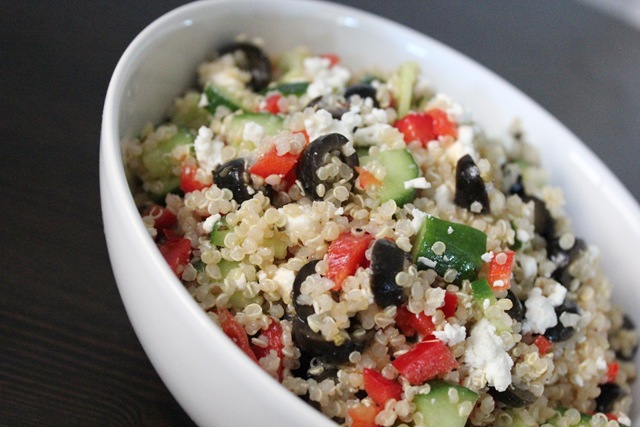 I had leftover quinoa from the batch I made this week, so making this simple salad was super fast and easy to make. Plus, you get the benefit of energizing B vitamins, muscle-relaxing magnesium and blood-sugar-balancing fibre. What’s not to love? I made this salad and let it sit in the refrigerator for a few hours before serving. I preferred it served cold and after a few hours, all the juices and flavors had a chance to mix together. This tasted so refreshing. The flavor is subtle, just a hint of lemon juice and oregano, which makes it very simple but good. I also appreciated all the different textures that you can taste from each bite. 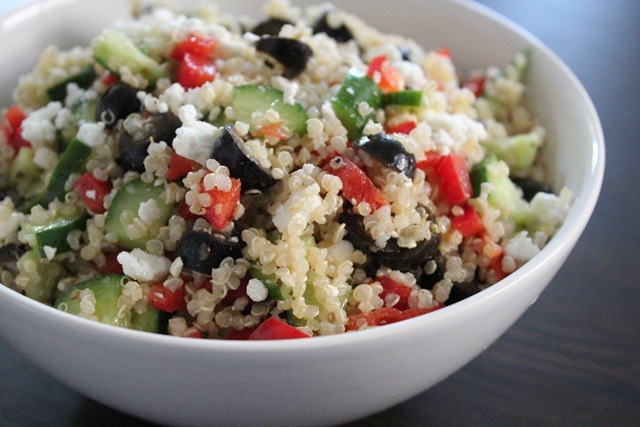 I have olive oil for cooking (taste is ok) and I have one bottle for fresh salad like this dish. 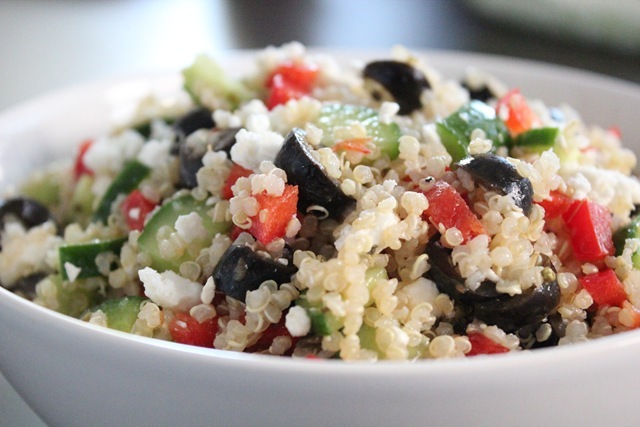 For this dish, I used the Olive Press Master Blend kind. I got this olive oil from Napa and taste great straight out of the bottle, even better with bread or on fresh salads. Next up, I want to try the Apple Oatmeal Anti-Muffin Tops recipe. 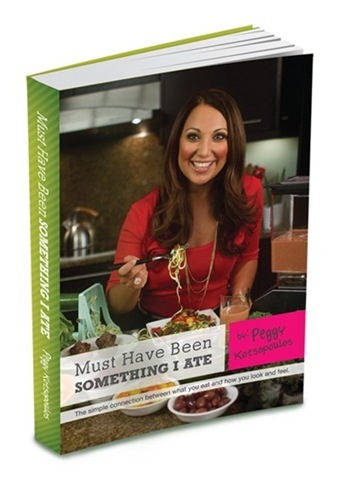 Now for the Vega Book Giveaway: Must Have Been Something I Ate, by Peggy Kotsopoulos. 1) Leave a comment about an instance where you said to yourself “Must Have Been Something I Ate” OR leave a comment about what you are currently doing to improve your health. Giveaway will end next Wednesday, June 1st at midnight. Winner will be announced the following day, on Tuesday’s post. Right now I’m just trying to eat right and exercise to stay healthy. Hey girl! Again- I am SO happy for you! Hope the trip and wedding and EVERYTHING is just spectacular. What a cool book. I love that sweet potatoes have soothing properties 🙂 I will have to increase my intake ;). And the salad looks yummy. Obviously, I am doing lots right now for the health of myself & my baby. Lots of fruit and veggies, protein & calcium! Also, no or very little caffeine and no alcohol! Congrats that your wedding is so near finally! Have a great trip! I’m running and eating healthy to improve my health. Just the other day I thought “must have been something I ate” when I was falling asleep at my desk after a pita sandwich at lunch. To improve my health I bought a garmin and started running outside! Oh wow I love vega products too! 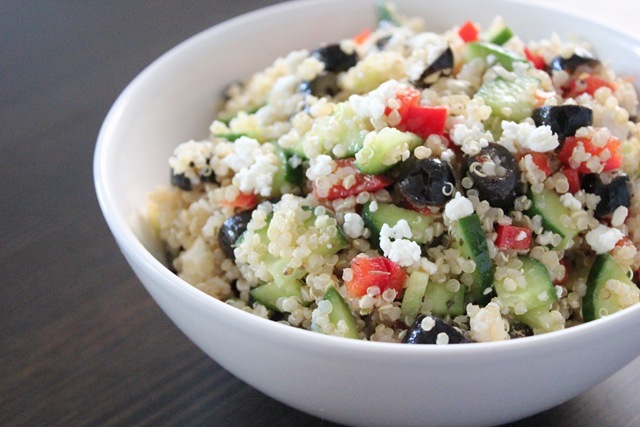 I made something similar but I used couscous, 7-mixed grain (precooked pouch from Fresh & Easy), sun dried tomatoes, pine nuts, olives and some some type of herb seasoning and a drizzle of Flax Seed oil, mix all the ingredients together and let it set. I sometimes use different nuts or veggies, I’ve gotten compliments on my dish at gatherings. May your wedding be the best it can be, fly safe and have a blast! To improve my health I am getting my water intake back up to 64 oz/day and eliminating the junk I had reintroduced. Tweeted about the blog – EJCorson is my username. I already like Vega on FB. Liked Healthy Coconut on FB. I have always tried to eat fairly healthy. After I watched the documentary Forks over Knives last January I have tried to limit my dairy. Recently I ate way too much of ben and jerry’s new ice cream flavor cluster fluff (which is delicious and I love the name). The next day I had a “must have been something I ate” moment because I slept in 4 hours later than normal and felt blah the whole rest of the day. Pretty sure it was the ice cream. Looking forward to seeing some lovely tropical photos! Happy Wedding! I am currently trying to live in the moment and NOT stress too much about the future. Just trying to do what I need to do and take it day by day 🙂 And get more fresh air of course! After being told that I had high cholesterol I did research on what foods I should and shouldn’t eat. I made a list once side was foods to eat, the other side of foods to avoid and taped it to my kitchen cabinet. That way I can look at it when trying to decide what I want to eat. I’ve become vegan and I’m loving the change in my life! In order to improve my health, I’ve finally started to run and exercise regularly again. Even when I maintain a healthy diet, I never feel as well as when I’m fit and active. Congratulations on getting married! I liked Vega on facebook. 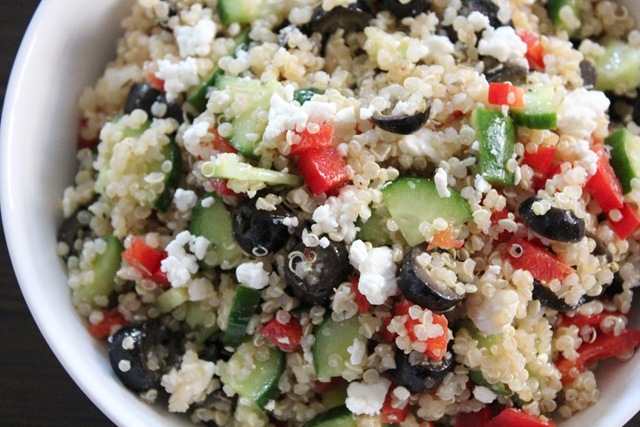 This quinoa salad looks so fresh and tasty, I want to make it ASAP! I’m trying to eat more fruits and veggies to be healthier, and less sweets. Congrats to you and Chris, best wishes! I am currently trying to eat as many whole natural foods as possible and also to walk more instead of driving. 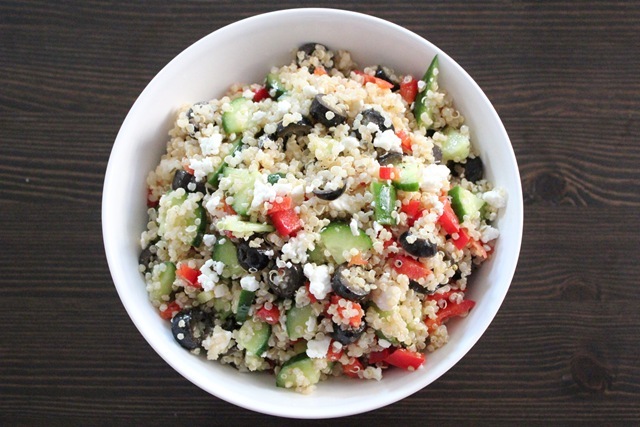 I’m working on eating more veggies and whole grains!